This week has been filled with all sorts of shark related fun, and we thought, "Why not have a party?!". Plus, I am all about any excuse to throw a party. Life's too short not to celebrate the little things. And by little things, I mean toothy creatures lurking on every beach of my family vacation ready to make me it's snack. I might be slightly traumatized from some of the episodes that I've seen. Slightly. But that doesn't stop my little family from soaking up all things shark. So...SHARK PARTY! I've kept everything super simple so that I could whip this together any time we had downtime this week. Before I left for vacation I ordered a ton of supplies from Oriental Trading. They have a ton of cute shark themed party items. They even had some fun nautical themed decor I was able to tie in. I love these navy striped runners, and as a bonus - they are washable! I love being able to re-use party decor. I placed it on top of my go-to reusable wipeable white table cloth, and then I sprinkled the table with this fun turquoise acrylic ice that I found. After dinner I was able to quickly set up the Shark Bar. Once the kids grabbed their goodies we settled in to watch. 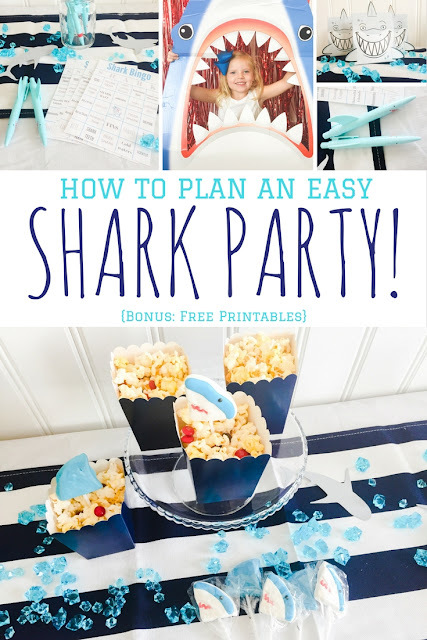 I put the bar together with a couple of fun shark themed salty sweet snacks, and a few activities the kids could do while they were watching. It all took a matter of minutes, but put a huge smile on their faces! I like to keep my party food fairly simple. Since this was just a little after dinner shark soiree everything I planned took literally seconds. These shark lollipops were the biggest hit. Not only were they yummy and adorable, they made for an easy way to tie in the shark theme to a pop corn snack. I simply popped popcorn, put it in a fun navy popcorn box, stuck the unwrapped lollipop in the popcorn, and sprinkled it with red M&Ms. Easy, themed, and delicious! These shark favor boxes also contained a yummy little treat. I made some Shark Bark, and placed a few pieces in each box. They gobbled this up faster than you could say, "Shark Attack!". Even though the main event was watching the Shark Week episodes, I wanted to throw in a few fun activities the kids could do while watching as well. Full Disclosure: I recorded everything ahead of time and made Mr. Cute (he happily volunteered) make sure it was "kid-friendly" before I let The Cutes preview anything. I set up a little shark booth so that during commercial breaks we could have some fun. 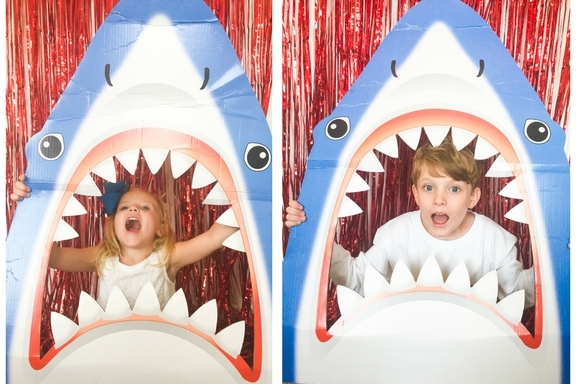 I love a good Photo Booth and when I saw this shark photo prop I couldn't resist. I re-used my red photo backdrop from the Emoji Party we had at the beginning of summer, and put out some sunglasses we had left over as well. It was hilarious and the kids had so much fun with it! And maybe I had a little fun with it too. During the show we played Shark Bingo. I made these cute little Bingo cards for the kids to interact with while they were watching their episodes. I found some super cute coordinating shark pens, and let them go. Whoever won got to read an extra shark story before bed time. This was a game that even Mr. Cute and I got into. The kids come by their competitiveness honestly. Another activity I had out were these Magic Color Scratch Sharks. L.C. has a short attention span - even when shark shows are involved - so I thought this would be an easy little thing the kids could have on hand. I doubled them as decor for the Shark Bar, and the kids loved how they turned into multi-colored holographic sharks. There were four different varieties included in the pack so they were able to get lots of coloring done if they wanted. Overall we have had a blast celebrating shark week and learning a little bit more about the rulers of the ocean. It's been a great summer time activity, and nothing is more fun than a little shark party. Have you been enjoying Shark Week? How do you make it fun?